Are you a podcast lover and can’t seem to get enough of them? Well, we perfectly understand how you feel. Therefore, in this article, we will show you some of the best podcast apps for iPhone so as to get access to a wealth of podcasts for your entertainment. 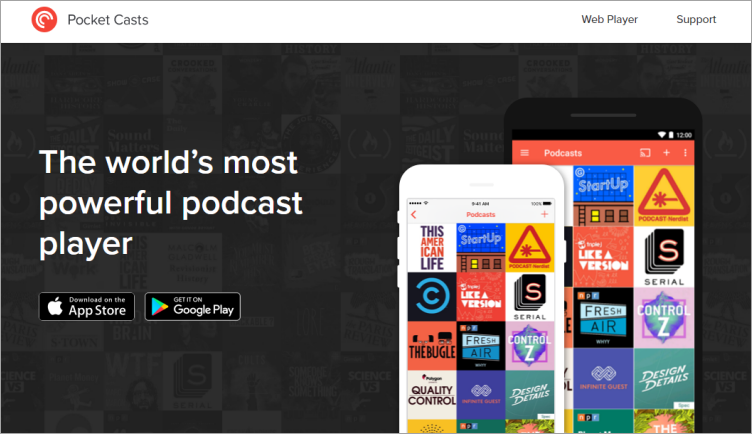 We have compiled a list of the best podcast apps for iPhone. We will highlight their best features and what they have to offer you. Let’s look at a detailed description of the top 5 podcasts apps. Overcast has a simple, clean, and attractive design that complements the user’s experience in a delightful manner. Its smart speed feature helps user to experience silent gaps when listening to their podcasts. The user can always create a custom playlist of their favorite podcast. While overcast doesn’t allow for streaming, as all podcast have to be downloaded which explains why its fast. 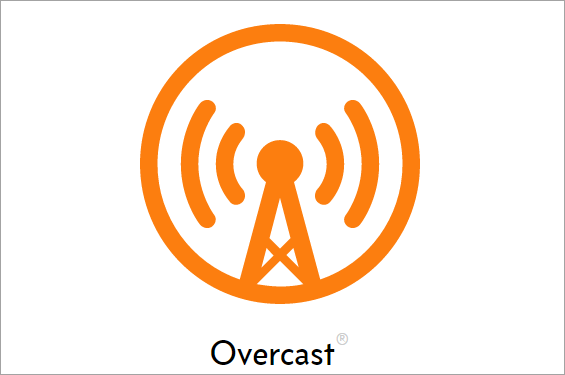 You can get overcast for free or opt for it paid version of $100 to get access to its full features. Pocket Casts a great podcast app, although it’s not free coming with a price tag of $3.99. It is compatible with both IOS and Android platforms, so you don’t have to worries if you own both devices. 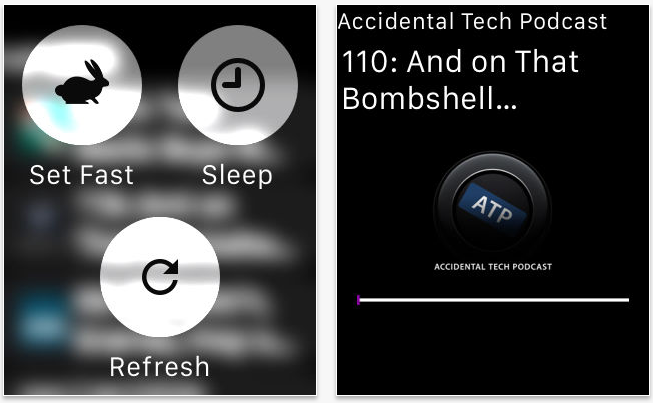 And best of all, Pocket Casts can synchronize your playlist on both. Unlike overcast, it offers not just audio podcast but video podcast as well. It will automatically download new episodes of podcasts you are subscribed to and notifies you. 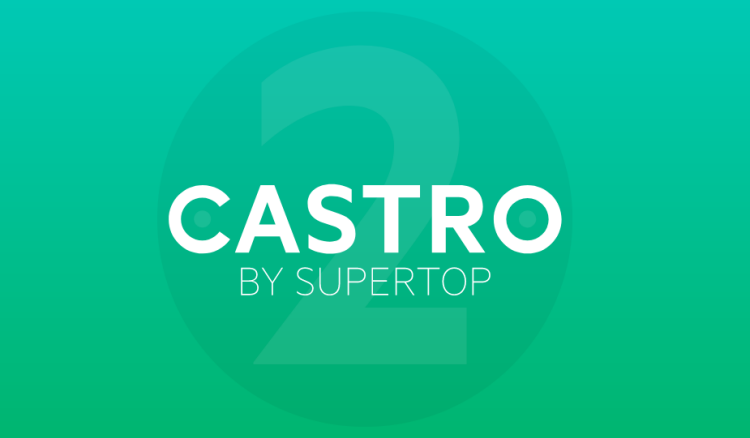 Castro is one of the best free podcast apps for iPhone, It boasts of great features like automatic downloads, offline downloads, and push notifications. With its new mode feature, you can always archive podcast you don’t listen to anymore. This ensures that you do not fill up your iPhone storage with unnecessary podcasts. All of these features make Castro one of the best podcast manager apps you can have on your iPhone. Pod Wrangler is another free podcast app with a very interactive design outlook. Its major focus is on simplicity as it is one of those apps that will let you know where your favorite podcasts are. It has a great syncing feature and works great with apple watch glance view. It also allows you download podcasts one episode at a time, enabling you to pick which podcast you want to be saved on your iPhone. 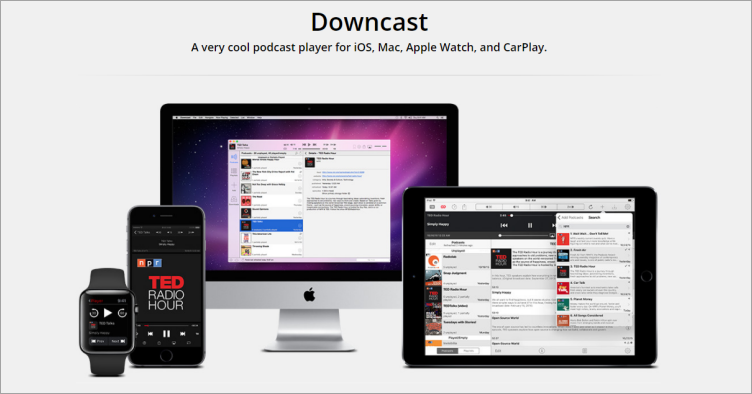 Downcast is a one of the best podcast apps for iPhone with a fee of $2.99. It separates itself from other podcast apps with a feature that automatically downloads your podcasts based on your location. It also boasts of a feature that automatically syncs your podcast with cloud services like Dropbox. Downcast also has a great Speed Boost setting and can allow you set a password to a certain podcast if you want. For all lovers of podcasts, we all know how some of our favorite podcasts can take up a lot of storage space on the iPhone. It is not uncommon to see a lot of user wanting to keep their podcast while free up space. Therefore, the solution is to save them on the computer where you can rearrange, organize, and save for listen at a later date. 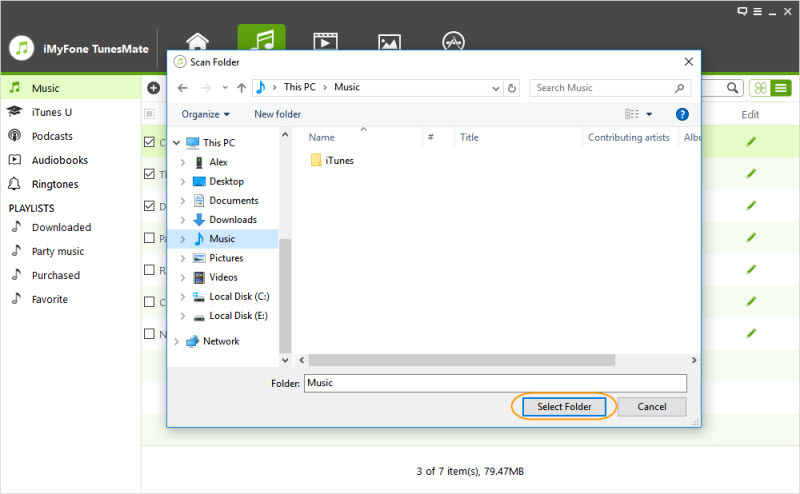 With iMyFone TunesMate, you can easily sync your podcasts to a computer with ease while by-passing some restrictions that come with transferring files using iTunes. With the All-Inclusive IOS Manager, the iMyfone TunesMates allows users to freely transfer files such as podcast, videos and much more to your computer without any restriction. 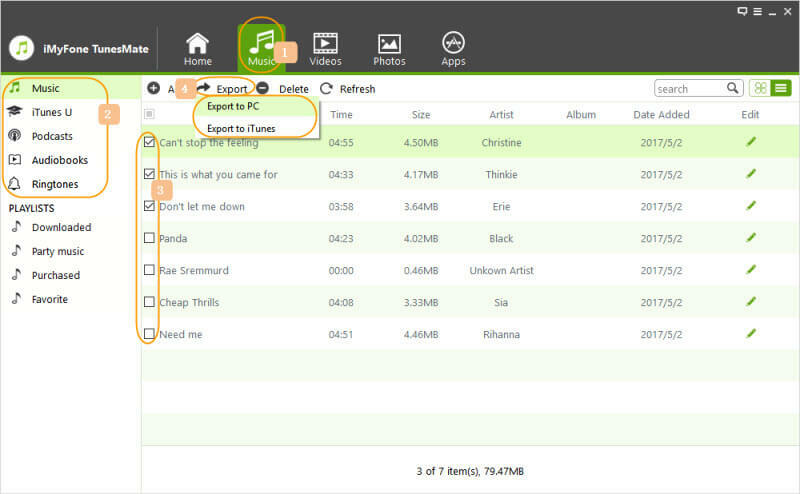 Making it one of the best alternative manager to the iTunes. The All-Inclusive Manager is a feature of the platform that supports all kinds of files ranging from music, podcasts, videos, libraries and many more. One of the unique advantages of the iMyfone TunesMate over iTunes it the fact that it allows two-way transfer among devices (such as sharing the podcast with multiple apple ids). You can transfer to and from a device anytime. It also allows you to transfer and backup images with its One-Click Feature. Step 1: Download the iMyFone TunesMate software and install it on your computer. Connect your iPhone to your computer using a USB. Step 2: Click on the Music icon. And select the Podcasts you want to transfer. Step 3: Click on Export and then Export to PC. Step 4: Browse the target Folder you want to save them on your computer.